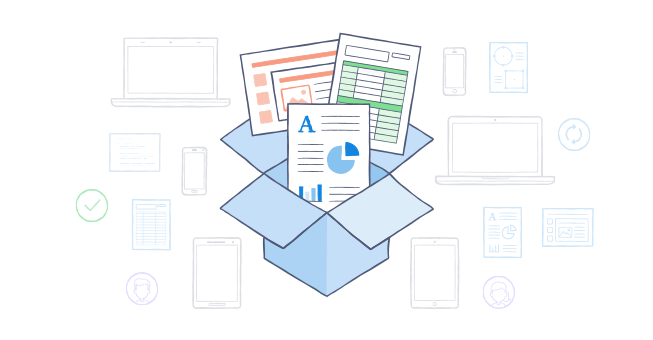 If you're transitioning from a legacy server to Dropbox Business, life for your team is about to get much easier. They'll be able to access data anytime and anywhere. If your team doesn't have a lot of data to move, they can simply copy and paste their files into the Dropbox folder on their desktop. Check out the Add your team's files article for more information. Communication is key - let your team know that you are migrating data from your server to Dropbox. They should avoid making changes to files during the transition. Think about how to prioritize your files - whether they're active files or older backups - for migration. Having a migration strategy will help the process run more smoothly. We recommend moving data in batches. Try starting the process overnight or over a weekend when your team is less likely to need access to their files. During initial data migrations, Dropbox saves a copy of your files to your local hard drive. Make sure your computer has enough space to support the migration from your server to Dropbox. You can always free up space on your local hard drive after the initial migration using Selective Sync. Note: This article is meant to show you how to move data from a single server computer to Dropbox. If you're migrating files that are stored on more than one computer or server, we recommend installing Dropbox on multiple computers and syncing the data that way. Important note: We only recommend installing Dropbox on a server during the migration process. We don't recommend installing Dropbox on a server on an ongoing basis. Install Dropbox on your server computer. Make sure you're accessing the server directly and not logging in remotely. Log in to the Dropbox desktop application with your admin account. This will create an empty Dropbox folder on the computer's main drive. Now that the Dropbox folder has been created on your server computer, you can start setting up your folders. From the server computer, copy or move the folders that you would like to sync to Dropbox into the new folders you created. Start with files your team accesses frequently and copy (or move) the data over in batches. Make sure you are continuously logged in to the server computer until the migration is complete. Don't log out, change settings, or power off the device during the migration process. The desktop application will only sync while you're logged in. You can check the sync status at any time using the desktop application. Once the migration process is complete, your team can transition from accessing the files through the server and use the Dropbox application instead. Finally, unlink your account from the server computer. Migration speed depends on your Internet connection and bandwidth. We recommend starting the migration process in the evening, or before a weekend. This will give you enough time to transfer all your files without interrupting your team's productivity. The Dropbox sync status displays an aggregate kB/s speed that includes this process. Once your files have been transferred to our servers, any updates or changes to the files will sync much faster. What is the best way to stay productive while I am migrating files to Dropbox? Can I work on files that have been uploaded to Dropbox while the migration is still in progress? Every business works a little differently. Some teams find that it makes sense to migrate archived files first. For others, it might make more sense to start with active files. Either way, we recommend that you move your files in batches, preferably when the data is not being accessed. This will help make the Dropbox syncing process smoother and faster. Avoid editing any files in folders that are still being synced to Dropbox or to any user's computer. At times, Dropbox is unable to sync files left open by certain applications. If this happens, close the application and Dropbox should resume syncing those files. As soon as a folder shows a green circle with a check mark for all users, you can safely collaborate within that folder. If you have a large amount of data, we recommend that you create a file structure in Dropbox Business first. Use blank folders and labels as placeholders for your data. After sharing these empty folders with your team, you can start moving data into the folders. Note: Dropbox doesn't allow you to share a folder that's contained in another shared folder. This is to ensure simple permission settings and sharing. For more tips on setting up a folder structure, check out our Set up your folders article. Move files over in batches. Wait for them to sync to Dropbox. Use Selective Sync to remove them from your local hard drive. Note: It's possible to use Dropbox with an external drive, but it has to stay connected at all times. The drive should be physically connected, not a Network Attached Storage (NAS) drive, and it needs to be properly formatted for the operating system of the connected device. I need help. Can I get support or assistance? Some companies prefer to use a 3rd party provider to help with the data migration process. SkySync integrates your existing network or ECM storage systems with Dropbox. Move or sync files, permissions, and properties across Dropbox and other systems automatically. Mover provides data migration and backups for any cloud storage provider. It also helps migrate and back up all data in Dropbox Business to any other online or on-premises storage.